Is Probate Required for a Home Transfer After a Will Was Written? Probate involves the legal process of transferring the title to property from the deceased’s name into the name of her beneficiary after her death. It is only necessary if the home does not pass to a beneficiary by “operation of law,” or when the law automatically transfers title after the death of one of the owners because of the terms of a contract. Depending on the title, a home might bypass the probate process whether the deceased left a will or not. If title to a home is held in the deceased’s sole name, it is part of his estate and should be mentioned in his will. Probate is necessary to legally transfer the deed to the home’s named beneficiary. When the home is encumbered by a lien or mortgage, most state laws require that the beneficiary either assume responsibility for the mortgage or refinance it into her own name. The deceased’s estate is rarely responsible for satisfying the mortgage unless the home does not pass directly to a beneficiary and instead becomes a portion of the “residual” of the estate, the value left to be apportioned between beneficiaries after debts and expenses are paid. In community property states, if the deceased purchased or acquired a home during the course of her marriage, the law states that she and her spouse each own half of it. In community property states, a married person can only bequeath separate property in her will, anything acquired before the marriage or personally inherited during the marriage. A surviving spouse automatically becomes the owner of a home after the other spouse’s death if it is community property. Probate is not required. Some deeds include “transfer on death” clauses which pass title directly to a named beneficiary by operation of law. These deeds are more common in situations where the home is owned in the deceased’s sole name. Real estate held this way bypasses probate. When a deed is held by two or more people as tenants in common, each owns a share of the home. When one owner dies, his share passes to his estate and to any beneficiary he named in his will. Therefore, if the deed to a home is titled to tenants in common, the deceased’s portion must pass through probate. Two people -- commonly husband and wife -- can also hold a deed jointly with rights of survivorship. 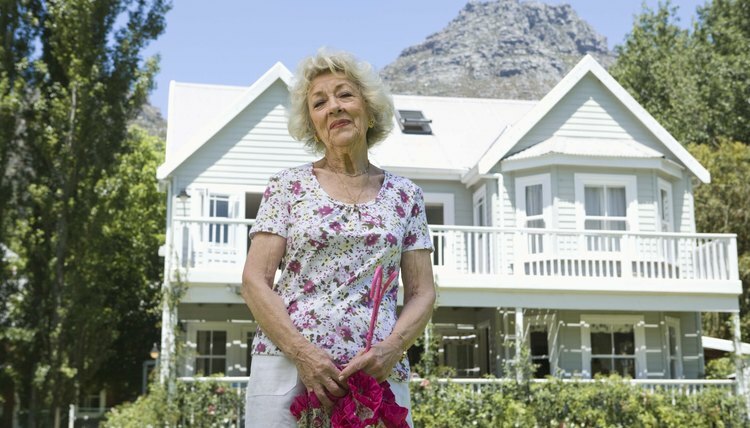 When a “rights of survivorship” clause is included in a deed, the surviving owner automatically owns the entire property when the other dies. Title is transferred by operation of law and does not require probate. Generally, it is only necessary to provide the county clerk with a certified copy of the death certificate. However, survivorship rights must be clearly specified in the deed. Otherwise, some states might deem it to be held as tenants in common and it would have to be probated for title to transfer. Who Is Responsible for a Mortgage When a Spouse Dies Without a Will? Can You Get Half of the Value of a House in a Divorce if Your Name Is Not on the Title? When you divorce, the court has authority to divide much of the property owned by you and your spouse. If you and your spouse can agree on property division, the court likely will adopt that agreement. However, if you can’t agree, the court must make its own division decisions. The share each spouse receives, whether or not his name is on the title, is dependent on state law and varies among states and judges. Is a Quitclaim Deed on a House Binding in a Divorce? Often, a divorcing couple's biggest asset is the home they own together, and this home must be split with their other possessions during their divorce. A divorce court can award the house to one spouse, which often requires the other spouse to sign a quitclaim deed to give his ownership rights to the other spouse. This type of deed is legally binding to transfer ownership, but it does not remove a spouse's name from the mortgage. Do I Need to Record a Divorce Decree With a Quit Claim Deed? Does a Beneficiary Need to Change the Title of a House Before Selling?